Thursday evening saw NZAL members and supporters share their insights with the Hon. Iain Lees-Gallaoway on the government’s workplace health and safety relations. 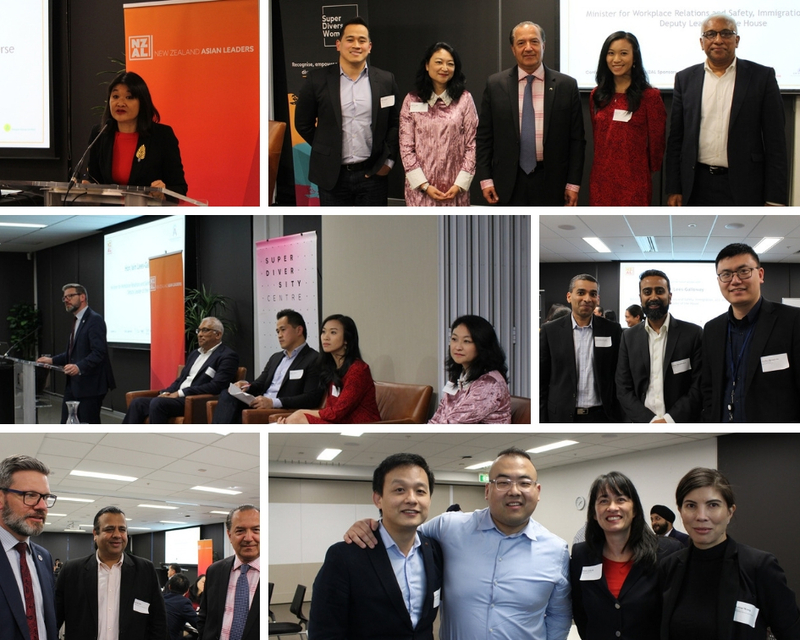 Hosted by NZAL corporate member, Chartered Accountants Australia and New Zealand, the session also included four NZAL members, Mikee Santos, Chairperson, Migrante Aotearoa, Jacob Mani Mannothra, Director, Zindia Ltd, Jenny Lim, ActivAsian Lead, Harbour Sport and Jade Leung, Project Consultant, Vector Limited, sharing their own perspectives from within their business, with the session facilitated by NZAL Chair and founder, Mai Chen. 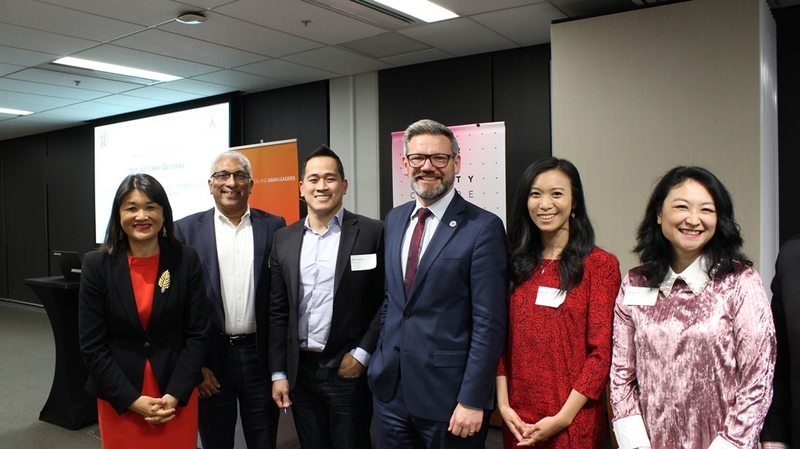 The Minister said he appreciated hearing from top Asian leaders about health and safety issues from their perspective and on behalf of their communities. focused on the various communities in Auckland and the different perspectives and attitude towards health and safety. He touched upon the government embarking on a health and safety strategy that sets out goals and priorities to drive sustained, system-wide improvements to NZ’s work related health, injury and fatality rates, including NZ’s ethnic workers. This was followed by NZAL members, Mikee Santos, Chairperson, Migrante Aotearoa, Jacob Mani Mannothra, Director, Zindia Ltd, Jenny Lim, ActivAsian Lead, Harbour Sport and Jade Leung, Project Consultant, Vector Limited speaking about health and safety issues in different industries that they work in, along with the health and safety measurements. The session was closed by Sameer Handa, Deputy Chair, NZ Asian Leaders and Managing Director, Glowbal NZ. Mikee Santos, Chairperson, Migrante Aotearoa highlighted his story and the working conditions of various Filipino workers in New Zealand. Migrante Aotearoa is the a grass-root, non-profit organisation that advances the rights and welfare of Filipinos and other Migrants in New Zealand. A Malaysian-born Kiwi whose career in sport and recreation started when she was 16, Jenny Lim is the ActiveAsian Lead at Harbour Sports. With an aim to increase Asian participation in sports, Jenny touched upon a few initiatives and programmes created to observe health and safety on and off the sport field. Jacob Mani Mannothra, Director, Zindia Ltd spoke about the high serious harm and injuries within the forestry sector, best practices observed by his company, and what is the new research, development and innovation needed within the sector to safeguard their working environment. An HR practitioner, Jade Leung, Project Consultant at Vector Limited spoke about the need for human understanding within organisations and a strategy to create health and safety practices based upon knowledge of different cultures.